1. I can’t ever write a character who’s more clever than I am! 2. I can’t ever write a character who’s funnier than I am! 3. I was supposed to be buying paper towels! I know this is a bit of an oversimplification. On the surface, it also seems inherently at odds with my certainty that a good author doesn’t only write characters who are versions of themselves. I still think that’s true. I can take the most basic emotions — anger, jealousy, happiness, etc. — and use my experience of them to create infinite permutations and exaggerations and variations of those emotions. A never-ending cauldron of characters, right there. But unlike emotion*, humor and intelligence are not inherent in everyone. And I really do think that being funny or smart are two of the very few things that you can’t just extrapolate from other experiences. I can write a fearless character even if I am not fearless, for instance, or a fearful character, even if I am not fearful. But I cannot invent humorous situations if I don’t have a sense of humor. And I cannot write an internal, brilliant philosophical observation for a character if I have not had it for myself. I suppose one could simply copy a joke into a character’s dialog to make them funny. Research a subject and blast facts out on the page for a smart character. Or just have everyone around them laugh at their jokes and be awed by their cleverness. And fake it the rest of the time. But as a reader, I despise being told a character is funny or smart when clearly they are neither. I’m a massive proponent of indirect characterization. A reader can experience characters and settings in a novel in two ways: she can know them, and she can feel them. Knowing is technically all a reader needs in order to get the meat of a story. In the simplest sort of story, a fairy tale or fable, that’s all there is. But feeling is what gets a story into your bones. It is how you infect a reader with your world. Should we do a for instance? Let’s do a for instance. 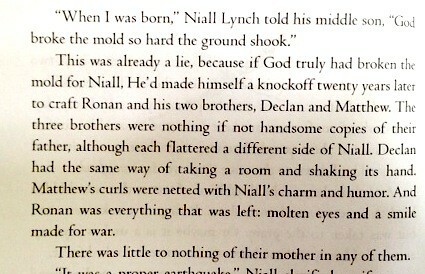 Niall Lynch had three sons. The oldest, Declan, was a political creature, slimy and disingenuous. The youngest, Matthew, was incredibly delightful and everyone liked him without any effort on his part. And the sarcastic middle son, Ronan, was always belligerent. Their father was far more of an influence on all of them than their mother. The reader would know everything I needed them to know about this family. It would be a perfectly fine basis for a story, I suppose. But I don’t think it would get under anyone’s skin. For that, I must be indirect. This is where that silly adage “Show, don’t tell” comes from. Really what it means is that you do everything you possibly can to make the reader understand the truth of the situation before you spell it out for them. Here’s a grand article Cheryl Klein wrote about Harry Potter a few years ago. In it, she points out that Rowling did tell you how a character felt, but only after she showed it to you first. So the telling served as a thesis statement, a topic sentence. Quite cleverly, she made sure that the reader both knew and felt the facts. So: about characters being cleverer and funnier than the writer. Possibly one could get around this by direct telling. But I think that you’d rob yourself of emotional resonance if you did. Is the trade off worth it? Maybe. Are the writers of Sherlock as clever as him? Maybe I’m just not a good enough writer yet to think of a solution to this problem. Maybe it isn’t even really a problem, because there are millions of character possibilities within my current mediocre level of brain power and humor. I still need paper towels. Maybe I should go for a drive and think about all this some more.